I know I have been away from my blog for a while due to my degree but I have been keeping up (live streaming all of London Fashion Week in the library!). 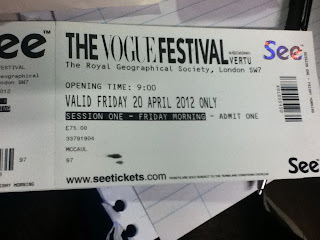 My latest endeavour has been the first year of The Vogue Festival. 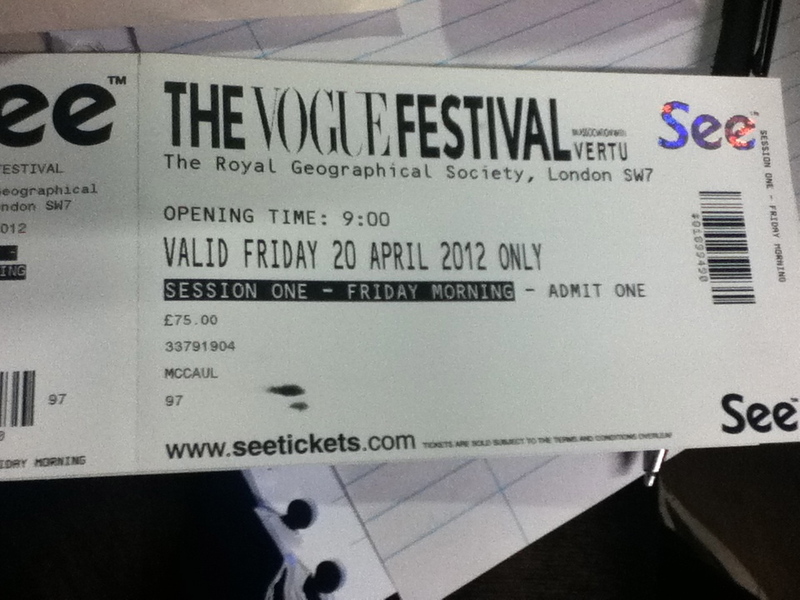 I went on the first day 20th April, 9am-1.30pm, and what was described as an experiment when amazingly well. First to be 'interviewed' was Christopher Bailey, who after the incredible London Fashion Week catwalk, had drawn me into this particular time and day. As you can see I was sitting quite far back from the photograph below! First working for Gucci, when he moved to Burberry he described it as a "incredible diamond trodden into the ground - had so much potential...needed love, care and belief". And that is certainly what he gave to it, turning it into a worldwide fashion label. When talking about his stores he said he wanted them to be seen as welcoming and not intimidating. As he talks about his job and the many places he has to travel to and see, I became increasingly jealous! In his own words he called his life a "privileged life" and that it certainly is. To be working somewhere I felt that passionate about is only something I could dream of, Burberry is not only a job for Bailey but his "baby". The next talk I was able to sit in on was titles "My Fashion Life" with Lucinda Chambers the Vogue Fashion Director, Matthew Williamson an independent fashion designer, Marigay McKee Chief Merchandiser at Harrods and Russell Marsh a Casting Director for models. You can just about see them here sitting together on the stage. Lucinda was the first to speak, and as it is my dream to work for Vogue I was so intrigued by what she would have to say. She started off with a line that I very much agree with, that you have to "see the power of clothes...can totally change how you feel about yourself", as she described a shopping trip she had with her friend. It is very true that we tend to stick to the same mundane look not exploring what other clothes out their may suit us, completely changing how we feel about they way we look. It seems she ended up at Vogue magazine through hard work and chance, starting at the bottom and working her way up to the top. She inspired me with the way she talked about finding inspiration from everywhere she looked, "have to look at all things in a special way". She described British Vogue as being there to inspire you and make you dream. Matthew Williamson very witty talk was described as "part1 of his life", with only 15 minutes to speak how was he supposed to sum up all his achievements that time? But what he did unveil was truly fascinating. He worked incredibly hard and fought the odds to achieve what he has today, telling use "you have to fight for what you want". When people told him he couldn't do something he was just pushed to prove them wrong (which he clearly has). His website http://www.matthewwilliamson.com/, shows how his hard work has paid off! Marigay McKee described herself as "not the most fashionable or most clever" growing up and talked about how she just "muddled through" in life. Working originally as a school teacher she moved into cosmetics then onto a buyer and then onto Harrods firstly working in the cosmetic department. She seemed to transcend from job to job but with Harrods she "fell in love" reminded of her and her mums love for Harrods as a child it became her dream job when she finally became the Chief Merchandiser. Russell Marsh was a interesting speaker to me as prior to this I had never known much about casting models and how it all worked. Russell Marsh would cast models for designers trying to make sure he has the right model for the right designer, telling us that the right model can "bring a collection to life". He looks for not just beauty but the way they dress their attitude! Once he has found this he is the one who teaches them to walk and how to hold themselves. His job takes great care in making sure each designer gets the right type of model in order to create an amazing reaction to a collection. What I took away mostly from these talks was that it wasn't just about who they knew, or a great academic ability but sheer hard work that got them to where they were today. Which has inspired me greatly to work hard to be where I want to eventually be! and got very excited when I saw a cover related to my dissertation on World War II fashion!